The original Patrón Tequila was produced by Casa 7 Leguas, one of the oldest Mexican distilleries. St. Maarten Spirits purchased the brand rights in 1989 and in 2002 production moved to a new distillery. In 2000, Ed Brown took over as CEO, and began to distance the Patrón brand from the reputation of tequila in the US as a bad-tasting spirit and what people drank for extremely quick intoxication. Following the advertising strategy of Grey Goose, Patrón presented its tequila as "premium" and signaled "taste and sophistication" through individually-numbered glass bottles. The target audience is mostly vodka drinkers in nightclubs and trendy bars. 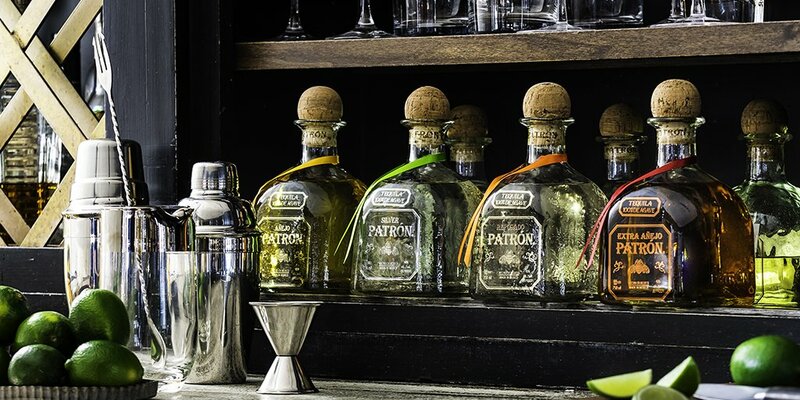 Through persistent references by country music and hip hop singers, Patrón has become a fixture of popular culture. Varieties include a tequila-coffee blend known as Patrón XO Cafe, a tequila-chocolate-coffee blend known as Patrón XO Cafe Dark Cocoa, and an orange liqueur known as Patrón Citrónge. Patron XO Cafe is a premium coffee flavoured version of Patron.